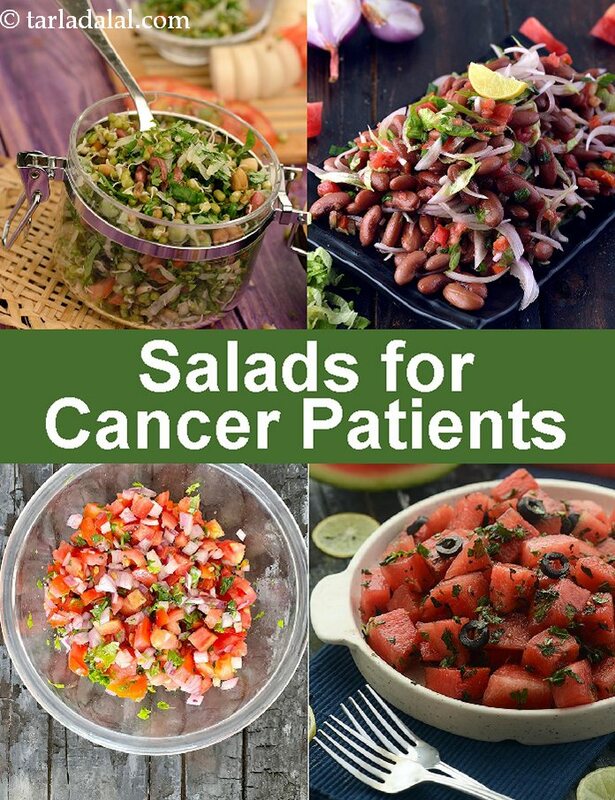 Salad recipes for Cancer, Healthy Salad Recipes for Cancer Patients. Salads are chock-full of nutrients like vitamin A, folic acid, iron, calcium, protein, vitamin C and other antioxidants, which strengthen your immune system and help fight cancerous cells. If you are on treatment of cancer, you need to include one salad daily for sure. Just remember to buy fresh ingredients, clean them very well and blanch ingredients wherever required. Ensure to not make and store the salad for too long also, to lower the risk of any other infection. 1. Choose the most nutri-dense greens to gain a variety of antioxidants. Romaine lettuce, rocket leaves and spinach for beta-carotene, kale for indoles, Amaranth leaves for vitamin C and so on…. Rocket Leaves Zucchini Red Pumpkin Salad and Kale and Avocado Healthy Salad are perfect examples of adding greens by way of salad. You can also toss a few paneer cubes to these veggie-based salads to add protein. It is an essential nutrient to support cell health - required for the repair and maintenance of cells. Paneer Tomato and Lettuce Salad in Tangy Dressing is a salad really worth trying. 2. Do not miss out on other veggies like broccoli for sulforaphane, cabbage for anthocyanins and cauliflower and red pepper for vitamin C.
Try something simple like a Cabbage Salad, which doesn’t need any other vegetable or you can opt for Rocket Leaves Broccoli and Veg Work Healthy Salad which includes a combination of exotic veggies with alfa-alfa sprouts. 3. Befriend sprouts while creating salad bars. Sprouting enhances the nutrient count and also makes them easier for digestion. They will give you energy and protein and keep you full for hours too. Kulith Salad with paneer and tomatoes and Mixed Sprouts Salad with veggies like methi, mooli, tomatoes and coriander are flavourful salads using sprouts. Do try them! They are healthy for the entire family to build their immunity. 4. Fruits can also hold a place in salad bowls. Vitamin C rich berries, orange, sweet lime, pomegranate and grapefruit as well as other fruits like pear, peach, apple are the most common fruits which people relish in their salads. This section has loads of fruit based salads like Pineapple Cucumber Salad, Fruity Chana Salad, Pear and Pomegranate Salad etc. Grapefruit is one such fruit, which most people haven’t tried. But believe it or not, it’s a very flavourful fruit. We have paired it with Green Apple to make Grapefruit and Green Apple Salad and with Orange to create another magical recipe – Orange Grapefruit and Mint Salad. 5. Roast and toss in a few healthy seeds. Turn to flax seeds, pumpkin seeds and sunflower seeds. They lend crunch along with omega-3 fatty acids which are necessary to reduce inflammation in the body and keep you healthy. Baby Spinach and Apple Salad in Curd Lemon Dressing makes use of sunflower seeds while Jowar Palak Kale Veg Antioxidant Healthy Office Salad has an inclusion of pumpkin seeds. Learn the art of roasting pumpkin seeds and roasting sunflower seeds to perfection. You can also experiment with healthy nuts like almonds and walnuts. While most times these nuts are just added in small quantity for crunch, in Walnut and Cherry Tomato Salad we have added nearly ¼ cup so that you benefit the most from its omega-3 fatty acids. 6. Create your own healthy dressing. Lemon based and olive oil based dressing work the best. Try and avoid cheesy and oil-laden dressing. In fact, you can even try fruit dressings. We have listed one such salad here – Green Salad with Muskmelon Dressing. In this section, you will also be introduced to fabulous dressings like the Sesame Dressing (Lettuce and Paneer Salad with Sesame Dressing) and Basil Dressing (Bean Sprouts and Cucumber Salad with Lemony Basil Dressing), which will ensure that you are never bored of salads. You can include these salads as a part of your lunch or dinner, or even enjoy them as mid-day snacks or carry some along when you go out. While it is easy to toss and mix veggies and dressing of your choice easily at home, many complaint about following that at work. The trick is here to chop and blanch the veggies as needed and carry them is a separate dabba with the dressing is a separate small dabba. If you intend to make salad your meal at work, a dal or bean and horde of veggies and fruits is what you should target including in your salad bowl. Mixed Sprouts Beetroot Healthy Lunch Salad, Vegan Healthy Lunch Salad and Kale Masoor Veg Antioxidant Healthy Office Salad are some ideas we have shared here for you. The variety of ingredients used in these salads give a colourful touch and exciting texture to the salads, apart from a plethora of flavours and nutrients. However rely on these salads as a meal only if it suits you, else make them a part of your lunch – they are healthy any ways. You are the best judge for your body. With time you will easily be able find out what’s best for you with the medications and treatment that’s going on for cancer. Eat sensibly and give your body the perfect nourishment to fight the disease and build new cells. Enjoy our Salad recipes for Cancer, Healthy Salad Recipes for Cancer Patients and other cancer recipe articles below.